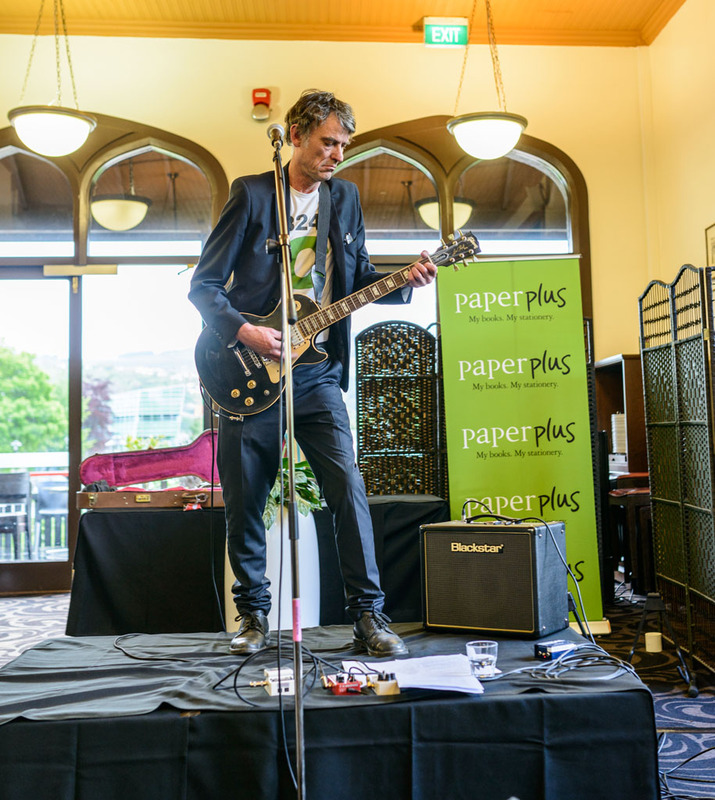 The Dunedin Sound: Some Disenchanted Evening was launched in Dunedin in November with live music by key players Graeme Downes (The Verlaines), Robert Scott (The Bats) and Martin Phillipps (The Chills). Ian, what inspired you to create this book when there are a few books celebrating Dunedin music already? I didn’t feel there was a book that celebrated the Dunedin Sound adequately. Certainly, Matthew Bannister’s Positively George Street told the story from his personal Sneaky Feelings' perspective, but you wouldn’t term it a celebration. And yes there are chapters in other books about the Dunedin Sound/Flying Nun scenes amid wider critiques of New Zealand popular music. There are also websites and many magazine articles over the years that are available online. But in my view the Dunedin Sound deserved its own standalone book. And I also wanted to be able to point out that the Dunedin Sound and Flying Nun are not interchangeable terms though they are often used in this way. 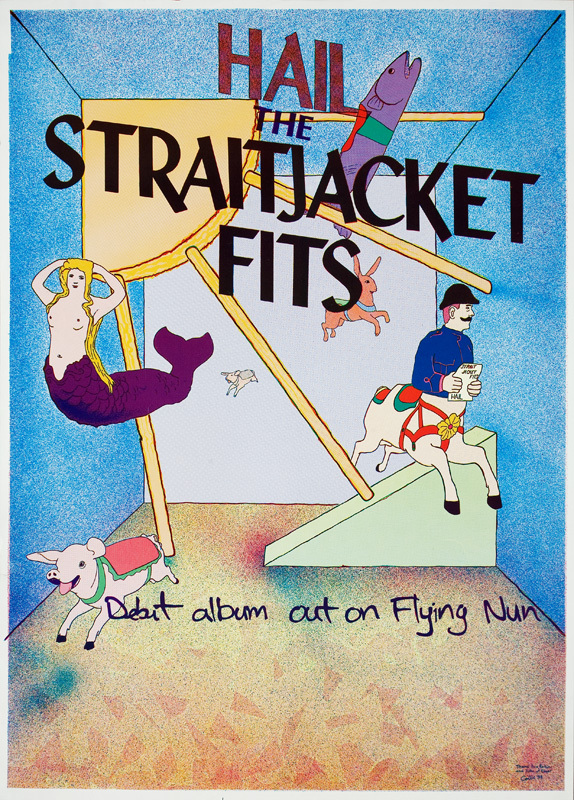 There were Dunedin Sound acts never signed to Flying Nun, and also a lot of Flying Nun acts that were not from Dunedin. I wanted to put Dunedin back at the forefront of the Dunedin Sound, which is why the book features only Dunedin acts. What do you feel this book is adding to the archive of Dunedin music history? As witnessed by the recent formation of the Flying Nun Foundation - with preservation a part of its goal, as I understand it - I think many people are starting to realise that the heyday of this scene was now more than three decades ago and time is precious. Peter Gutteridge has recently passed away, and the main protagonists will not be around forever – that’s the cold reality. With the book being so wonderfully pictorial, I very much had the sense as I was collecting photographs and ephemera from here there and everywhere that this historical flotsam and jetsam is equally not going to last forever. Preserving it in a book like this – I’ve felt as much a historian, archaeologist and curator as an author. Simply, like the excellent job the the Hocken Library (in Dunedin) does, I hope this book with become part of the archive of Dunedin’s music history and ensure such ‘stuff’ is not lost forever. Tell us about some interesting things you discovered in the process of creating the book? Hidden gems unearthed? I knew it before I started on the project, but through talking to so many musicians, fans, and others involved in the scene in some way or another, it brought home to me once again how contentious the term ‘Dunedin Sound’ is. Even within the camp. That was interesting. I was also reminded, when talking to others from the era who weren’t involved in ‘the scene’ – mostly musicians of other ilks – of the resentment that still exists regarding the media attention and resultant opportunities that the primary proponents received. It is still seen as something of a ‘club’ by many, and not always in a good way. In terms of hidden gems unearthed, there are so many images that have never been seen before, and finding these – from old suitcases, basements, tops of wardrobes – stuff that hasn’t been seen the light of day for 30 plus years – was the biggest thrill. Forced to name a couple, I’ll mention the wonderful early photos of The Enemy taken by Ian Bilson and Josie Haines. Discovering these really got my heart racing. 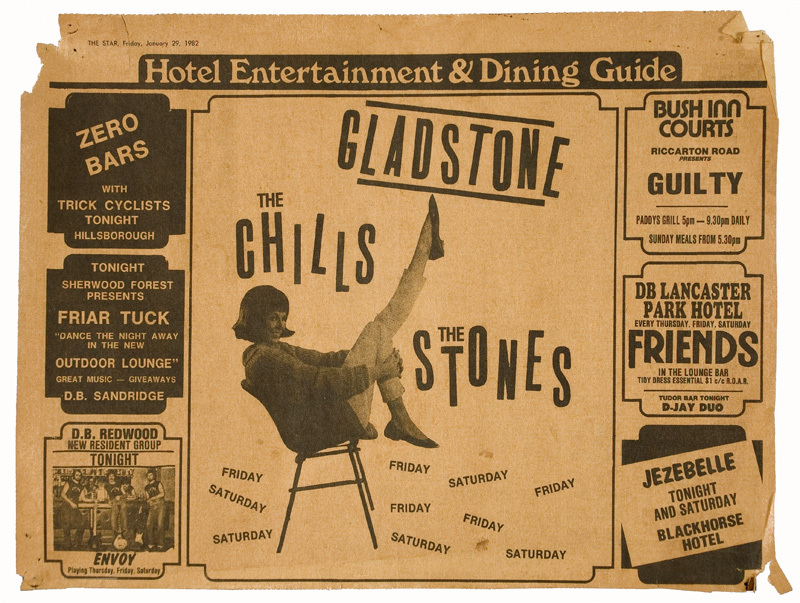 Another discovery was just how close the music and the artwork/design aspects of the Dunedin Sound was. Again, I’d expected it, but not to the extent I found. With so much of the artwork and design done by the musos themselves, or by close friends and family, there’s a synergy between the two that you could never have got from faceless, uninvolved designers trying to portray the music while working in an office behind chrome and glass at some mega record company located in another city. What have you enjoyed most about putting this book together and what were the challenges? I enjoyed the feeling of preserving history, and meeting so many awesome people. Key collaborators on the book's content included Graeme Downes, Alan Haig, Robert Scott, Stephen Kilroy, Roy Colbert, Sarah Williamson (research assistant). But really, everyone was wonderfully supportive of the project. The biggest challenge was finding the origins of hundreds of photos. Many great pics were supplied to me by people who had them in their possession but had no idea who took them in the first place or how they came by them. More often than not, once I’d tracked them down, the musicians in the photos didn’t know who took them either, being so long ago. So, being a cold-case detective was extremely challenging. I still have dozens of fantastic pics in my ‘photographer unknown’ folder on my laptop that didn’t make it into the book for that reason. 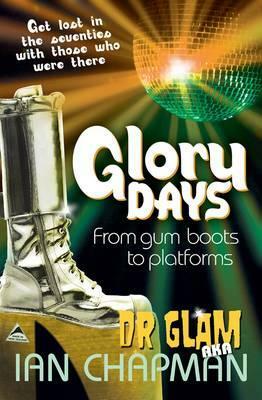 You also wrote Glory Days: from gumboots to platforms (2009) and are a musician yourself. Can you talk about your alter ego, Dr Glam? Sure. He’s a glittering 1970s-esque glam rocker based upon Bowie’s Ziggy Stardust persona. He was my confidence-resurrecting imaginary escapist fantasy figure during my very troubled teens (during the 1970s) but was laid to rest when I left my teens behind. When I started teaching at the university post 2000 I wanted to show my students an example of a performance persona in order to help them learn to combat nerves and stage-fright etc; ways to suppress self-doubt and become 10ft tall and bullet-proof on stage. So rather than just talking about it, I brought Dr Glam out of the crypt and began performing. I had an absolute blast, and it got the message across as my students saw their quietly spoken genial lecturer become a posing, pouting, glittery monster in 8 inch platforms, makeup and spandex, ha ha. (Did I mention the fun aspect???) But, by its very nature, glam rock(ers) shouldn’t go on for too long, and so I killed him off in 2014 at a dramatic Death-of-Dr-Glam gig. Nite nite and thanks. But I pulled him out of the grave one more time for this year’s David Bowie tribute show at Sammy’s. To all intents and purposes, though, Dr Glam is dead. I have since reinvented myself in the guise of his anagrammatic cousin, Mr Glad, and with my band, The Skeleton Family, we do twisted cabaret type gigs now and then. Thanks Ian... Can you recommend some music-related books and DVDs that you really enjoy? In Love with These Times by Roger Shepherd. The story from the horse’s mouth. Very Short Films Flying Nun DVD. A great visual snapshot of the era. 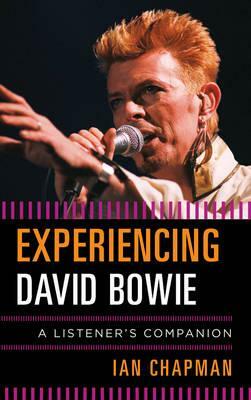 Experiencing David Bowie: A Listener’s Companion, by Ian Chapman. A fan tries to comprehend how a skinny white Englishman changed the face of popular music. 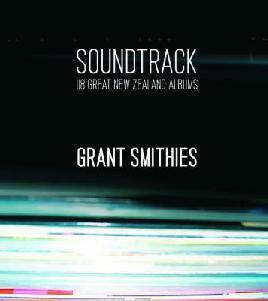 Soundtrack: 118 Great NZ Albums by Grant Smithies. Great acknowledgement by Grant – and many other invited writers and musicians (myself included) – of New Zealand's popular music’s finest moments. David Bowie: Five Years documentary. The best Bowie doco yet made. 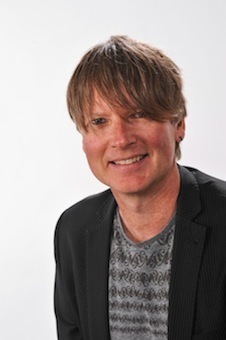 Ian Chapman is a musician, author and Senior Lecturer in the Department of Music, Theatre and Performing Arts at the The University of Otago. A musicologist, he is working on his seventh book at the moment titled Experiencing Alice Cooper: A Listener’s Companion (Rowman & Littlefield 2017), which pays album-by-album tribute to another of his rock-theatre heroes. Several others have been working on related books including one by Graeme Downes. 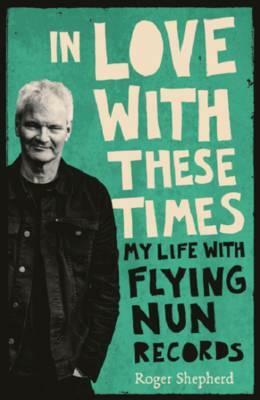 Alan Holt is writing a book about the history of Flying Nun Records; Graeme Jefferies memoir Time Flowing Backwards is due out April 2017 and Needles & Plastic: A Flying Nun Discography 1981-1988 (2016) by Matthew Goody and Sean Elliot is out now.